Irish boxers Michael Conlan and Jason Quigley both progressed to the next round over strong opposition today. We also had our first all-APB bout with two signed boxers putting each other to the test over three rounds here at the AIBA World Boxing Championships Almaty 2013. Today it was the return of the Light Flyweights (49kg), Bantamweights (56kg) and Middleweights (75kg). Middleweight Florentino Falcao Esquiva from Brazil struggled against a fit looking Artem Chebotarev of Russia. In a bout that pitched two APB boxers against each other, we were expecting to witness an exceptional confrontation and this one did not disappoint. In what was a nonstop whirlwind of activity, both boxers imposed themselves at various times, but the balance of power certainly rested with the Russian. By round three, the Russian was clearly dominant and really battering Esquiva. So it was that Chebotarev took massively the win (3:0) to move through to the quarter-finals, where he will be a force to reckon with. Another APB boxer that was impressive today was Bantamweight Vladimir Nikitin who faced Veaceslav Gojan from Moldova. The Russian looked more convincing than on his last outing where he essentially adopted battering ram tactics. Taking on a very serious opponent in Gojan, he needed to be more sophisticated. This became apparent early on; Nikitin pressured his opponent but the Moldovan was smart and worked hard to keep the game at his preferred distance. The Russian began to evolve his tactics and towards the end of the third, he forced his opponent into the corner and offloaded some unanswered heavy combinations on him. Despite Gojan's obvious skills, Nikitin proved to be too much for him and he cruised to a clear-cut win. Former USA Knockouts boxer Michael Conlan of Ireland took on fellow WSB boxer Brian Gonzalez (Mexico Guerreros) at Bantamweight. The two orthodox fighters put on the kind of display you would expect from boxers at this level. The Mexican as ever wanted to push the pace but with the Irishman willing to stand and bang, he had to be more cautious than he was in previous bouts. Then Conlan tried using evasive techniques at first but soon found that Gonzalez's speed made that impractical and that also he could do more than hold his own in the trade-offs. He looked to keep the pace of the bout under control. 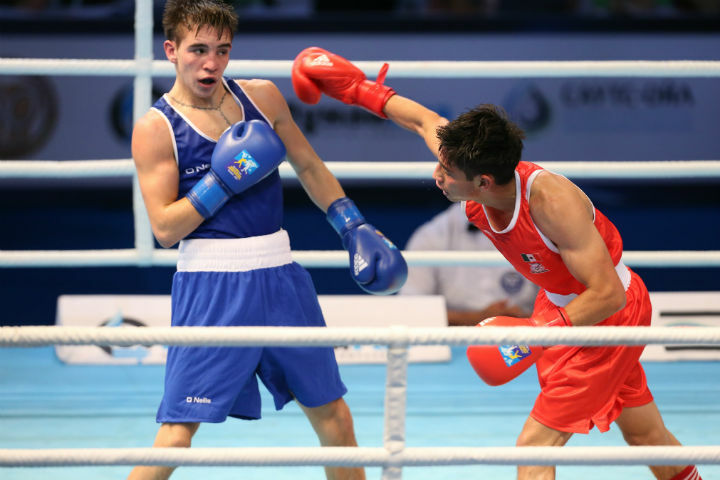 Conlan landed some extremely hard lefts to the body throughout round two and three, and this more than anything began to turn the bout in his favour for the win. "I could tell I was hurting him with the body shots", said the Irish. "But he is a class opponent. He has very fast hands but I knew he wasn't able to take the shots I was giving him". Benson Njangiru of Kenya faced tough Azeri Javid Chalabiyev at Bantamweight. The African was perfectly happy to get in there and mix it up with the Azeri, trading heavy shots and complex combinations in a very brave performance. In general, as the competition progress, the bouts are getting closer and this was no exception. But after a fine performance from Njangiru, the Road to Almaty boxer lost by split decision and Chalabiyev advances. Zhanibek Alimkhanuly of Kazakhstan beat Juan Mercado of Mexico this afternoon. It wasn't so much that the 6th seeded Kazakh got the victory that was surprising, it was more the way in which he achieved it. The emphatic nature of the win, which was one of the finest from a string of solid performances from the host nation, will send a clear message to his Middleweight rivals. The Mexico Guerreros boxer was barely able to get more than a dozen shots off in the whole of round two while the Kazakh boxer engaged in what was effectively target practice. With Alimkhanuly putting on such a boxing master-class, the local crowd again became highly vocal, which only added to Mercado's woes. The Mexican got a standing eight count in round three and was forced to retire a few moments later. This bout was only going one way from the beginning and the Kazakh certainly put his mark on the competition. Elsewhere Mohamed Flissi of Algeria looked good against the very dangerous APB boxer Bin Lv. The Chinese took to the centre of the ring and made use of his highly accurate punching skills in an attempt to pick off the Algerian Light Flyweight. Flissi meanwhile made use of his great footwork to evade the Asian boxer and worked his hooks to the body and the head to disturb the Chinese athlete's rhythm. This continued across all three rounds in a high paced bout. The Algerian boxer managed to squeeze past Lv to progress to the next round. "I changed my game plan and started hitting him with some good shots. He smiled at me.and that is when I knew I was hurting him" - Jason Quigley (Ireland) on his win over Aston Brown of Scotland.